Posted under Health Guides. Updated 8 September 2016. The decision to stop smoking can seem overwhelming, but you can do it. Half of all the people who have ever smoked have quit, and so can you. If you’ve tried to quit smoking before and it didn’t work, you can use what you learned before so you can be successful this time. It can be very hard to quit, but once you do, you’ll feel better and be healthier. 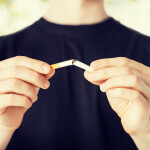 There are many benefits to kicking the smoking habit. Stopping will lower risk for many health problems which include different types of cancer, heart and breathing problems. However, in order to be successful at quitting, you’ll need to figure out the reason why YOU should quit. For example, you would feel better now and prevent serious health problems when you’re an adult, you would be a good role model for your younger siblings, you would have more energy and be a better athlete, and you would save a lot of money. What can I do to help myself succeed at quitting? If you’ve tried to quit before, think about why it didn’t work. What can you do this time to help yourself succeed? Tell your family and friends that you’re quitting. Ask them not to tease you about it, because you are serious. Ask them to support you by not smoking around you and not offering you cigarettes. Throw out all your cigarettes, lighters, and ashtrays. If you’re going to be a non-smoker, you won’t need these things again. Talk to your health care provider about over-the-counter nicotine replacement methods such as the nicotine patch, gum, lozenges or prescription medicine such as nicotine inhalers, sprays or non-nicotine medicines. However, for these products to work, it’s important to use them correctly. Make sure your health care provider or pharmacist explains how to use them. Join a support group at your school, in your community, or online. Find someone you can call for those times when you feel like you’re having a weak moment and might smoke a cigarette. This person should know that you’re trying to quit and can remind you of all the reasons why you decided to give up cigarettes. What can I do so I won’t smoke again? The hardest part about quitting is breaking the habits that go along with it. For example, if you are used to smoking with your friends when you are hanging out together, it will be hard to hang around with them and not smoke. The best way to keep from smoking is to not put yourself in situations with people who smoke and to stay away from places where you are used to smoking. Decide why you want to quit and write down the reason- “to feel better”, “run faster”, etc. This will help motivate you and remind you why you quit in the first place. Avoid places and situations where you usually smoke. Spend less time with people who smoke. Go to non-smoking places with your friends, such as the mall or the movies. Don’t drink alcohol. Alcohol will likely lower your willpower and increase your chances of having a cigarette. If your family smokes, ask them to not smoke around you. Plan activities during the first couple of weeks to take your mind off smoking. It will be easier to quit if you keep yourself busy. How will I feel when I’m quitting? If you’re a regular smoker, your body has gotten used to having nicotine and other chemicals around all the time. You will probably feel some symptoms of withdrawal when you stop smoking. This means that you might have a headache, feel queasy, and uncomfortable or nervous or you may just crave cigarettes. Many people worry that they will gain weight once they quit smoking. In reality, many do gain a little but not enough to change how they look. People don’t gain weight because they stop smoking. They gain weight because they start eating more. Often, people confuse the feeling of craving nicotine with hunger and then eat to try to make this uncomfortable feeling go away. Smokers are also used to having something in their hands and in their mouth, so they may pick up food to replace holding a cigarette. Drink sips of water instead of eating when you feel uncomfortable. Snack on carrots, celery, and other healthy foods instead of smoking. Exercise. This will also help take your mind off smoking and make you healthier. Keep busy. You’ll be less likely to eat when you’re not really hungry if you’re doing other things. When will the nicotine craving go away? Within weeks, the nicotine craving will go away and you’ll feel more like yourself. In the beginning you also might feel frustrated, moody, or depressed. It may seem like you are all alone in your suffering and that no one understands what you are going through. Although this will be hard, these feelings will go away with time. After a couple weeks, you will be over the hardest part of quitting – the physical addiction, when your body feels like it needs nicotine. However, it may still be hard to resist having a cigarette. The habit of having a cigarette in your hand and smoking while you do certain activities, like talking on the phone or hanging out with friends, can be difficult to break. After I quit can I have a cigarette once in a while? Many people get through the toughest part of quitting and mistakenly think that they can start smoking a cigarette once in a while again. Very soon, their old habits come back and they find themselves addicted once again. Quitting is hard for most people, so once you quit, make a commitment to yourself that you won’t light up again. Quitting is too hard for me – I gave in and had a cigarette. Now what? If you give in and have a cigarette while you are trying to quit, don’t worry. This doesn’t mean you can’t quit. Quitting is a very hard thing to do, and it is not surprising that you might break down and have a cigarette at some point. The important thing is not to use this as a reason to become a regular smoker again. Think of it as a mistake and tell yourself that you won’t let it happen again. You can do it! What happens if I really start smoking again? If you try to quit and it doesn’t work, don’t give up. Quitting is very hard. Think about why quitting didn’t work for you. Only YOU know why you like to smoke, and only YOU can figure out what it will take for you to quit. Start thinking about what you can do to help yourself quit for good. Try quitting again in a few weeks and use what you learned from your first experience to make it work the second time. SmokefreeTXT: A free mobile service designed for young adults who live in the United States. SmokefreeTXT was created to provide 24/7 encouragement, advice, and tips to help smokers stop smoking for good.